Sometimes politics repeats itself, not only taking history and turning it into farce, but taking farce and turning into the fake news which is now called entertainment. Pieter-Dirk Uys is sorting out 40 years of distress, disguise and disgust: from apartheid to tripartite, from amandla to Nkandla, from Brexit to Zexit. Wigs, glasses, wagging fingers, toyi-toyis, red berets, trump cards of madness, icons and aikonas; from Bezuidenhouts, Raubenheimers, Ramaphosas to Altzheimers. At a time when a casual greeting or embrace can be seen as racist or harassment, the advice is simple: when in doubt say darling. If you can’t remember their names, just say darling. If you get lost along the road to somewhere, simply ask for Darling. 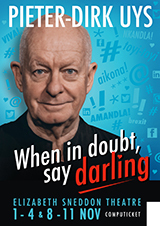 He did it, and now Pieter-Dirk Uys also lives in Darling. Join him and many darlings on an exciting walk to the edge of the next cliff when the end of the world seems nigh.